Kerami Manor is the rebuild of the original art deco Kerami Guest House which was lost to the 2009 Black Saturday fires. The new grand manor house has beautiful views on the deck overlooking Marysville. 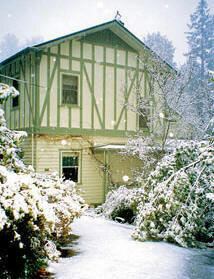 Kerami Manor offers an elegant, grand atmosphere – the only of its kind in Marysville. The manor is conveniently located only 400 meters from the center of Marysville and within walking distance of eateries if you wish to venture out. For your convenience, there is on-site car parking for guests cars.